In ancient Egypt cinnamon was used as a medicine and for embalming mummies, in Rome it was valued more highly than gold. Through the middle ages its sweet woody scent made it popular in cooking – especially in dishes such as pies and pastries. While Chinese medicine and Ayurveda have long revered cinnamon as a superpower used to treat a plethora of illnesses such as colds, indigestion and cramps and to improve energy, vitality and circulation. 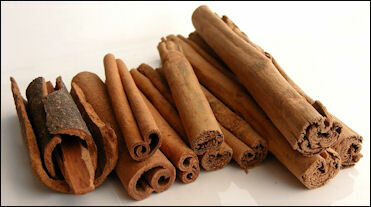 Cinnamon heats the digestive fire – thus promoting a healthy digestive system. It also has a natural cleansing action that stops the growth of microbes and kills bacteria. It is a great source of manganese, fiber, iron, and calcium. In Ayurvedic medicine, honey is known as ‘Yogavahi’, which translates as ‘the carrier of the healing values of the herbs to the cells and tissues.’ In other words, it it is believed that honey when mixed with another healing herb or spice enhances its medicinal qualities and helps it reach the deeper tissues in the body more effectively. Like cinnamon, honey has strong antimicrobial properties and the combination of the two can be a powerful barrier to fungi and bacteria. Drinking a mix of one teaspoon of ground cinnamon and one teaspoons of honey in a glass of hot (not boiling) water twice a day will help cure bladder infections, ease period pain (cinnamon is a powerful ant inflammatory) and common colds and when drunk morning and night over several weeks or months may assist in weight loss as cinnamon boosts metabolism and encourages more effective digestion. A paste of equal parts cinnamon and honey can be applied on the hair and left for fifteen minutes to prevent hair loss, or massaged on to areas afflicted with arthritis twice a day (drinking a tea of honey and cinnamon will also ease the symptoms of arthritis as it helps improve circulation and brings warmth to the body) You can also try applying the paste to an aching tooth to relieve some of the pain. Mix all ingredients together and store in a glass jar. Gently rub on the skin while showering and rinse off with warm water.